Hospitals and health systems are under more pressure than ever to improve patient care and lower mortality rates. It’s difficult, however, to figure out the gaps in care that lead to above average rates and percentages that inflate the cost of care, let alone convince a board to fund improvements. 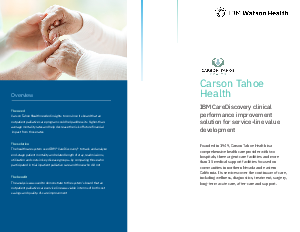 Download this case study to see how Carson Tahoe Health, a multi-facility health system, used IBM CareDiscovery data to prove to their board how an outpatient palliative care service line was viable in both cost savings and quality of care improvement.